Mythical Creatures, Enchanted Murals, Magic, and a weird bunch of Demigods. Wait... this is not Clash of the Titans rather this is a story about Clio (Rachel Alejandro), a Greek Muse who's quest is to inspire humans to achieve their greatest creation of art. One day Clio decides to descend from Mount Olympus to Venice beach, California to help inspire a struggling artist in the name of Sonny Malone (Felix Rivera). But when Clio, now disguised as an Australian Roller Girl named Kira suddenly falls into a forbidden affair towards Sonny, Kira is now facing an eternal punishment of being banished to the Netherworlds for the rest of her life. Adapted from the 80's cult classic starring Olivia Newton-John, Xanadu is a 2007 musical comedy with a book written by Douglas Carter Beane and music and lyrics by Jeff Lynne and John Farrar. I got the chance to see this show last Wednesday night as Atlantis production invites me and some of my friends for an advance viewing. I don't really have any idea about the show and the only reference I have is the movie itself. The musical could be inspired by the movie version but this show is a completely different take. 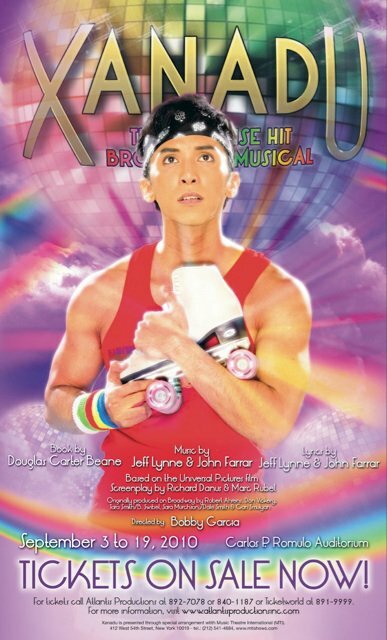 Rather than a serious love story, the writer decides to rewrite Xanadu as a musical comedy. To make the story much more interesting, they even added a lot of Greek Mythology elements which is openly inspired by Desmond Davis' classic film Clash of the Titans. Xanadu Musical is not a big production. It is more characterized as a short, sweet and hilarious 1 act parody of the film which explains the exaggerated accents noticeable on both Kira and Sonny. I won't even argue about the actors' acting abilities. Both Rachel Alejandro and Felix Rivera did a pretty good job on their respective roles considering that exaggerated comedy is quite hard to perform. And it is also evident that the two do indeed have chemistry as a person as compared to their last project where they are acting on the guise of puppets. Muse of Epic poetry (Yael Pineda). Redefining the meaning of the word "bitchy". 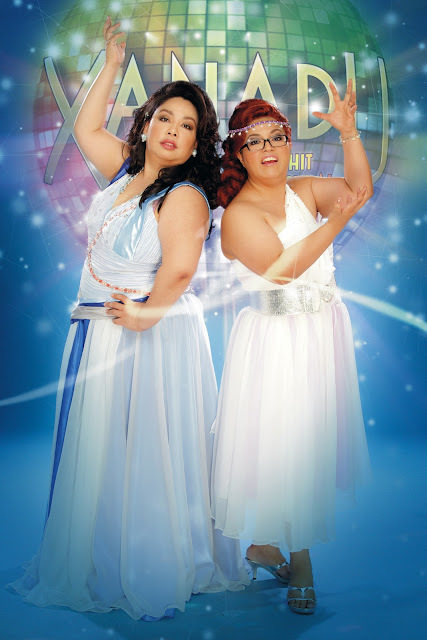 The company also didn't fail to amuse me specially the evil muse sisters Melpomene, Muse of tragedy and Calliope, Muse of Epic Poetry played by Chari Arespacochaga (Dogeaters) and Yael Pineda (Disney's Lionking) respectively. They really redefine the meaning of the word "evil" and "bitchy". While I don't have any problems about the acting, it seems that I saw some flaws on vocals. Sometime the company can't hit the high notes on most of the songs. And when they are dancing, I can hear their breaths and they have problems on sustaining. It is like some of the actors expect their co-actors to fill in when they stop singing. Or maybe it is the sound system. But either way, this part needs a lot of improvements. The dance numbers are not too special but since the show is a comedy, It is tolerable because they really look funny while doing it. I also suggest that the cast must take more precaution during the roller disco sequence because one of the actors, Ms. Bea Garcia (playing Euterpe, muse of Music) to be more precise almost fell on her back. So be more careful guys. We don't want to see real blood on stage. But of all the dance numbers in the show, I should say the best one is the tap dance routine of the Young Danny Maguire played by Anthony Ong (who also played Thalia, the Muse of Comedy). I love how the number is executed. Judging Ong's resume that includes High School Musical, West Side Story and Hairspray, this fantastic dancer is no doubt one of the best performer that night. The set on the other hand is quite simple but props and costumes are well designed. Wait till you see the cameo roles in the end especially the 4-legged one which is my favorite hehe. Summing up everything, Xanadu is one hell of a fun ride. Despite being short, I'm sure you will enjoy every bit of the musical. Directed by Bobby Garcia (Avenue Q, Cinderella), fall in love and laugh with us. 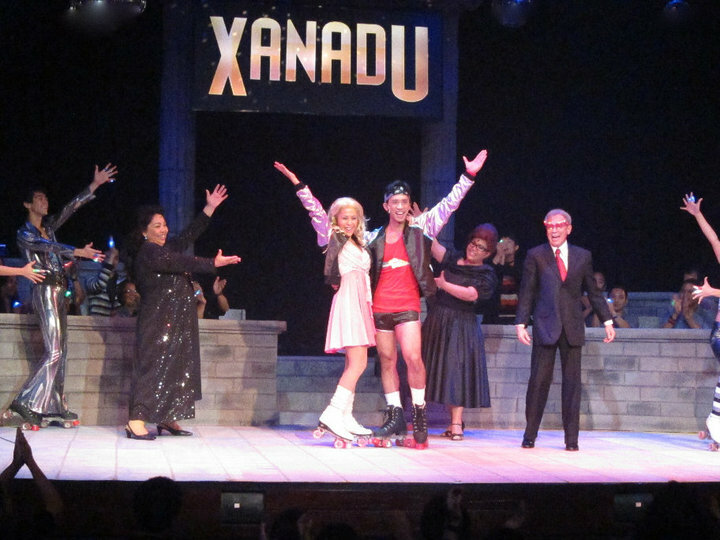 Catch Xanadu when it opens today, September 3 at the Carlos P. Romulo Auditorium, RCBC Plaza, Makati. For tickets call Atlantis Productions at 892-7078 or Ticketworld at 891-9999.
some photos taken from Girlie Rodis Facebook account.